This guide is designed to help you with the topic as you study it throughout the entire first two years. It will also help you with the MCT bone and cartilage unit. 1) If you begin with a patch of mesenchymal cells, how does hyaline cartilage arise? Name the two centers of chondrification. How does each contribute to cartilage growth? Distinguish appositional from interstitial growth. 2) What morphological/cytological features would you use in distinguishing an actively secreting chondrocyte from a quiescent cell? 3) What are the components of cartilage matrix? How can they be modified to fit the function of cartilage at that site? 4) In sports injuries, why is damage to the articulating cartilage difficult to repair? Why is a herniation of the nucleus pulposus so painful? 5) What unique property of cartilage allows it to be used in transplants without immunosuppressants? 6) What changes in cartilage matrix are seen with aging? 7) Distinguish periosteum and endosteum. What type of tissue is found in each region? What are Sharpey’s fibers? 8) Compare and contrast the routes taken by blood vessels to osteocytes and chondrocytes. 9) Compare and contrast the matrix of bone and cartilage. How does the mineral component of matrix change with age, nutrition, and exposure to the environment. 10) Following an injection with tritiated thymidine (to detect dividing cells) a subset of bone cells is labeled. 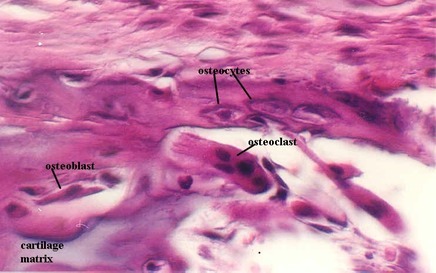 Which subtype of bone cell would you expect to be dividing? 11) How and where would you identify osteoblasts? What is their function with respect to bone deposition and resorption? How does parathyroid hormone work on this system? Where does the hormone calcitonin act? 12) As we exercise and learn new physical activities, our bones are continually remodeled to withstand new stresses. What cell types are most important in this process? 13) Distinguish intramembranous ossification (give examples) from endochondral ossification (give examples). What is endochondral ossification? 14) Define the process of bone repair (after a fracture). 15) What are the major causes and problems seen in rickets and scurvy? What happens if we have too much or too little vitamin A?